Dear Tesco, please stop encouraging me to buy things that I really don’t need! I have fallen prey to your voucher system more times than I can count and now own about seventy-two Fissler pans, a set of Pyrex oven-to-hob-to-freezer-to-whatever dishes and enough cutlery to serve an army with! I simply cannot resist something that, on the face of things, seems like a bargain. Take these Fissler pans for example: the stockpot, with ten vouchers, cost me £29.99. In Harrods (I checked) it was just under £200. WHAT AN IMMENSE SAVING! I thought, and then proceeded to buy every single pot and pan that was on offer. 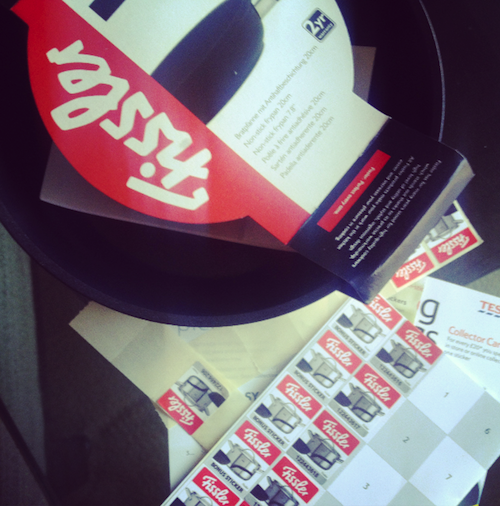 Going backwards and forwards to Tesco, collecting the vouchers (one per £20 spent, you work it out!) and feeling pleased as punch as I added pan after pan to my collection. Pleased as punch until Mr AMR worked out how much I had been spending. I could have bought a whole set of kitchenware for the amount I’ve invested in my Fissler pans! I could have bought an entire bloody kitchen! Can someone please remind me, next time that Tesco entice me with an offer, that I do NOT need any more kitchen stuff? Printer ink, yes. A new linen basket – yes. Pans, no.